A lamp consists of many different pieces structurally, but for the sake of style there is the lampshade, the stand, and the base. A lampshade can be made of several different materials, but three of the most popular are linen, marble, or chrome. A traditional white linen lampshade can add a soft lighting to a room. A marble lampshade can add a beautiful sophistication to a room. Finally, a polished chrome or other metal lampshade can add a sleek and modern look to a room. 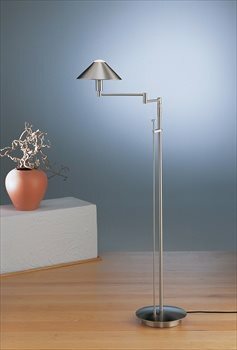 A lamp stand and base (when applicable) can also be made of different materials, but popular materials for a lamp stand and base are metal, wood, or glass. Some people may want to go for a traditional, but still modern look of a wood lamp base and stand with a white linen shade. Others may want to go for a modern elegance with a glass stand and base and a marble lampshade, or an ultra-modern look with an all chrome lamp. A high quality lamp or other lighting accessory a can be an important focal point in a room. A low quality and cheaply made lighting product will not only look poor, but it will not last as long as investing in a high quality lighting product. Whether someone wants a traditional, sophisticated, or modern look to the lighting in their home décor they should always invest in a high quality lamp, whether it is a floor lamp, table lamp, or wall sconce. When people know understand what functionality they need from their lighting accessories they can choose the best accessory for the room they are decorating. Some lamps made be made of different materials from wood, glass, and metal with the base and stand to linen, marble, or metal with the lampshade. The style of lamp a person chooses depends on their personal style, but no matter what a high quality lighting accessory should be chosen.